NOTE: Due to the overwhelming response of Guardian applications, we are currently not seeking guardians who do not already have a veteran to travel with. Guardian applications received without a veteran requesting that guardian will be held until needed. Each veteran is assigned a guardian. That guardian is responsible solely for that veteran. 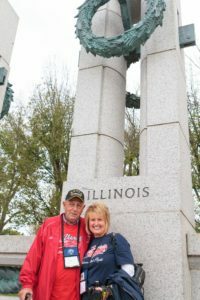 Guardians are essential to the success of Honor Flight. Without these volunteers we would not be able to carry out the dreams of so many veterans, enabling them to see the memorials built in their honor. Depending on the circumstances, other specific requirements may be imposed. If you have questions, please contact us. Guardians are responsible for their own transportation to/from Veterans Airport of Southern Illinois. Each guardian must also pay $600 to cover their flight expenses. While this is less than the actual cost, it ensures Veterans Honor Flight can continue operations. Because of their importance, we will provide training to all Guardians prior to their flight. Guardians are required to attend this training.